Every year, I write a review of a Christmas-related film for the holiday. This year, I have opted for two reviews: one on Christmas Eve, one on Christmas Day. This is motivated by the fact that Christmas-related films are released around this time, and rather than separate a regular review from the Annual Christmas film review, why not have the best of both? 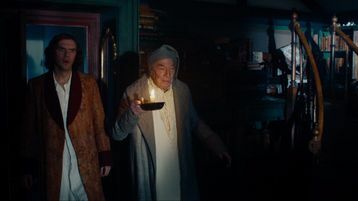 The Man Who Invented Christmas is the first Christmas-related film I've reviewed that is also a biopic, as it is the story of Charles Dickens' artistic crisis as he attempts to get back into the public's good graces with A Christmas Carol. What is now a perennial holiday event, done countless times on film, television and radio started out as Dickens' comeback. The Man Who Invented Christmas never makes the case for its lofty title (especially given that Jesus Christ probably 'invented Christmas', but why quibble). It's an unbalanced affair, drawing on other films and story ideas while failing to tell a potentially good story. It has been a year and four months since Charles Dickens (Dan Stevens) has come from a wildly successful American tour (where he was greeted with wild cheers and the playing of Yankee Doodle Dandy, never mind that George M. Cohan hadn't actually written the song until 1904, a good sixty two years after Dickens' tour, but again, why quibble). His last three books after Oliver Twist have all flopped, leaving Dickens in dire financial straits, not that his spending has slowed down any. He not only has the financial burden of keeping up appearances, his growing family, and household staff, but he also is sending money to his parents. However, it isn't charity or love that motivates Dickens: it's a desire to keep his irresponsible father John (Jonathan Pryce) out of Charlie's luxurious hair. John, for reasons of his own, has no problem selling his son's autograph to make more money, and the appearance of him and Charlie's mother at their house for Christmas isn't particularly welcome. Charles is desperate for money and for a hit book, and with only his agent Foster (Justin Edwards) by his side, Charles has to endure many indignities, including Charles' frenemy William Makepeace Thackeray (Miles Jupp). Talk about Vanity Fair. Overhearing a new Irish maid, Tara (Anna Murphy) tell the Dickens children ghost stories soon starts Charles' creativity flowing. A new story, a short novel comes to him. It is to be titled Humbug: A Miser's Lament. Little bits come to him: an overheard conversation, an accidental visit to a solitary funeral, the sight of street urchin hiding under coats. We see a brief visit from Charles' sister, who has a sickly little son who needs a crutch or his father's broad shoulders to move about. Soon, the character of Ebenezer Scrooge (Christopher Plummer) emerges in all his irascibility and selfishness and greed. It isn't long before other characters from Humbug: A Miser's Lament start popping up, and at certain points even mocking Dickens. If the indignity of Mrs. Fezziwigg laughing at him isn't enough, Charlie still has to deal with his father's irresponsibility, Charles' own haunted memories of his time working at Warren's Boot factory gluing labels as a child, and the pressures of getting this Christmas book out by Christmas. Eventually, after coming to terms with his own haunted past, he can give Scrooge that bit of redemption and hope, and finish the newly-retitled A Christmas Carol, which is published on December 19, 1943 and is an instant hit. 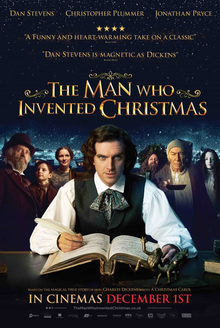 I have not read Les Standiford's nonfiction work on Dickens and his creation of A Christmas Carol, but the film adaptation of The Man Who Invented Christmas by Susan Coyne makes it look like a very offbeat comedy. As such, I figure that Standiford's book must be a laugh-riot and not a serious tome on the creative process of an author who is on the low end of his career. Coyne, intentional or not, has crafted a variation of things we've already seen before. As I watched The Man Who Invented Christmas, and did my best to stay awake through it, I could not help flashing back to Shakespeare in Love. The Man Who Invented Christmas is at the very least 'inspired' by that film in terms of structure: a well-regarded writer facing a writing crisis comes up with a new idea and an awful title to go along with it. In Shakespeare in Love, our dear Will was embarking on Romeo & Ethel, The Pirate's Daughter. In The Man Who Invented Christmas, our dear Charlie was embarking on Humbug: A Miser's Lament. Both films also have our author pick up bits of dialogue and scenes that would find their way into the future and classic Romeo & Juliet and A Christmas Carol respectively. They even end with hints of more works drawn from real-life. In Shakespeare in Love, it is Queen Elizabeth I's command for something lighter for Twelfth Night. In The Man Who Invented Christmas, a cop who tried to arrest Charlie only to not when he saw who he was introduced himself as "Copperfield". At that point, I wanted to all but strangle almost everyone involved in this work. Copperfield? As of Coyne and director Bharat Nalluri weren't satisfied to do a variation of Shakespeare in Love in all but name, they went one further and appeared to draw bits from Six Characters in Search of an Author, as the various characters wait around for Charlie to get back to them, at one point I think even going on strike until he sorts things out. Now, a film where we follow Scrooge and Tiny Tim as they wait out their resolution would have been good. A film that dealt more with how Dickens came up with his ideas and changed them would have been good. A film that had him interact more with his characters might have been good. The Man Who Invented Christmas was none of those things. Yes, sometimes they did touch on them (a scene where Tara insists Tiny Tim cannot die to a disbelieving Dickens was good), but for the most part I think the film thought it was a comedy. Many moments were meant for laughs that were actually groan-inducing (such as Dickens trying to hide from Thackeray by hiding behind a newspaper with "CHARLES DICKENS" in super-bold print). Adding to that, why exactly was Thackeray so gleeful at Dickens' 'Hard Times'? Such aspects the film has no interest in building to. Mychael Danna's score more often than not played with The Man Who Invented Christmas being a bad comedy, often making the music cutesy. Dan Stevens' performance did not help matters: his Charles Dickens (which makes one sing 'There was a little girl, who had a little curl, right in the middle of her forehead...') was a lot of mugging and exasperation. I'll give him credit that when he did have some drama, such as when he confronts his genial but irresponsible and slightly tottering father, he did well. However, more often than not Stevens made Dickens less a literary genius and more a slightly befuddled and irresponsible lucky man. When Dickens went to his solicitor, at one point after he asked for more money, I expected him to tell him, "Please sir, I want some more!" Bless Christopher Plummer, who apparently decided he was in a different movie altogether and played it so. His Scrooge was excellent: sinister, difficult, caustic, but in the end fearful, regretful, and on the verge of total panic. Pryce too was far more interesting as John Dickens, charming and caring but irresponsible, than his forever flustered and rushed-about son. I think a major flaw in The Man Who Invented Christmas is that because we already know the final story, there is no real suspense of what will happen. The comedic take the film starts with then tries to shift to a more serious drama, and it fails to be either. Stevens is directed to play a lot of things for laughs, so by the time he is more dramatic, a lot of the seriousness is lost. It isn't as if there isn't a story to be made out of how Dickens came to create a story that is now ingrained in the Yuletide tradition. However, The Man Who Invented Christmas ends up diminishing his genius: his creation of A Christmas Carol happening, not because he came up with the ideas and characters, but because he happened to overhear and see things that he just slipped into the story. At times, the creative element is good but it's a bit too self-satisfied, as if they were playing a 'spot the reference' game. Look: Charles' nephew has a crutch. Look: some man tells Charlie, "Aren't there workhouses?" Look: there's an old man named 'Marley'. Look: a man struggles with a giant moneybox. It becomes tiresome and worse, a terrible disappointment. The forces, internal and external, that shaped both Dickens and the creation of A Christmas Carol deserve a much better version than The Man Who Invented Christmas.